While I was traveling with family last year, I had the rare but delightful opportunity to meet up with the owners and creators of Multimok in Utah. It’s not often that I get a chance to chat one-on-one with the creators of a hammock, but I find it absolutely fascinating. The duo went out of their way to meet up with me and do a personal, hands-on demo of their Multimok, mult-purpose hammock. The Multimok is a multi-point hammock that can be pitched in a number of ways thanks to the dozens of connection points around the perimeter. The webbing is sewn with a unique “o” pattern that provides strength in all directions. The four corner loops have 50 mm metal O-rings sewn in that are the primary hang points. A polyester liner can cover the webbing to create a more comfortable structure to lay on, if needed. My biggest complaint with multi-point hammocks is finding a place to pitch them. The good thing about the Multimok is that it isn’t as dependent on having perfectly aligned trees as much as the Tensile hammock. And with the additional tie-out points, there’s more options for finding the right angle to make it work. The guys at Multimok walked with me to a local park and we found three trees that worked pretty easily. I wasn’t sure we would find anything, but thanks to the hammock’s minimal requirements, we made what I would have thought was a “less optimal” location work just fine. The other thing I noticed during the set up was that the Multimok didn’t require ratchet straps, or the need to crank the platform taut. The owners just used basic webbing straps and pulled them hand tight and we were done. 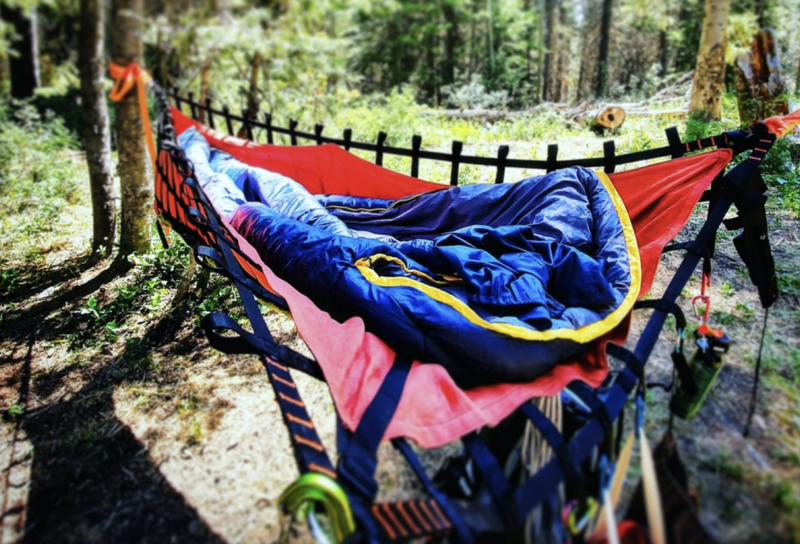 The three-point recommended set-up is really a hybrid hammock with a bridge-style on the head end and gathered-end on the foot. To make this work, the foot end must be hung much higher, but the effect leaves you with a flat head to toe lay. But what about the grid? The first question folks ask me is whether you can feel the grid. Yes! But it isn’t bad. The flat webbing doesn’t dig into your back and when you add the liner, it evens out the tension even more so it’s hardly noticeable unless you think about it. If you use a pad, there is no grid to feel. Speaking of insulation, the Multimok can use either pads or under quilts, or a combination — perfect for really cold camping trips or when you need to supplement lighter weight insulation on the cheap (e.g., combining a 40-degree under quilt with a closed-cell foam pad to achieve a much warmer rating). With just the platform with multiple tie-outs, you could, conceivably, drop a two-person tent on top and make your own elevated bivy. Using a large tarp could easily cover the platform or other configurations. But what about the weight? I’m not sure why I have to even answer this question, but it seems that invariably someone is going to complain how heavy it is. Do all hammocks have to be lightweight? No. So if you’re looking for a sub-ultralight platform, you’re going to be disappointed. Sure, you could make a lighter platform out of Dyneema cordage, but I’m not sure what you’d gain besides a julienne backside. This is not a shelter for the UL hikers of the world. It’s great for car camping trips or maybe even pulling along in a pulk for long-term winter camping, or maybe even short backpacking trips (maybe). I would probably stick close to my car if I were to take this out. Suspension and Anchor System ★ ★ ★ ★ ☆ Multimok includes all the suspension, but you can purchase them separately as well. It may not be the most intuitive suspension system, but it works, and you could easily try other options like cinch buckles, carabiners and daisy chain webbing if you wanted, since you don’t need ratchet straps. Construction and Craftsmanship ★ ★ ★ ★ ☆ Excellent craftsmanship; straight, even stitching; reinforced; quality materials. Some stray threads. Modularity ★ ★ ★ ★ ★ Multiple anchor points provide nearly unlimited pitching options. Aesthetics ★ ★ ★ ☆ ☆ Basic colors and patterns. Utilitarian. Price and Value ★ ★ ★ ★ ☆ Offshore production and low prices makes this a cost-effective option.